The Trulux Tunable White Remote Control allows you to easily and wirelessly dim and adjust the color temperature setting on your Tunable White Trulux tape light. With this convenient hand-held remote control, there are no wires to run or anything to install. Simply sync it up to a receiver, and you're good to go. 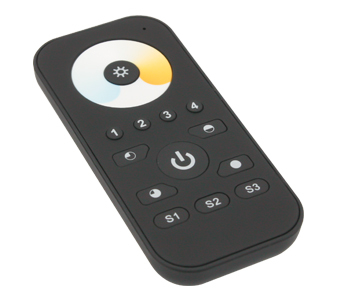 This remote features a sensitive color wheel that you can use to adjust the color temperature of your Tunable White tape light from 2700K-6000K. There are also quick access buttons for on/off operation, preset dimming percentages (25%, 50%, 75%, and 100%), or you can hold down the dimming button for full range dimming down to 1%. You can control up to 4 separate zones and customize up to 3 scenes per zone. 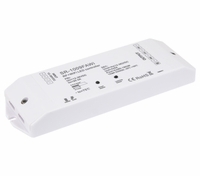 The Trulux Tunable White Remote Control is designed for multi zone (up to 4) operation of Tunable White Trulux tape light, and must be paired to an RF receiver. 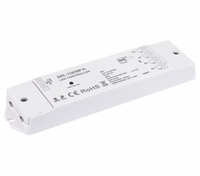 You can control multiple receivers and multiple runs of tape light as multiple zones. Radio frequency (RF) signal range is 65 feet from dimmer to receiver. No input power is required, as remote control is battery operated. (3X AAA batteries not included.) A convenient wall caddy to holster the remote is included.